Relatively unknown to many international travelers until only a few years ago, the Riviera Nayarit may be a fresh destination on the Mexico tourism travel scene. 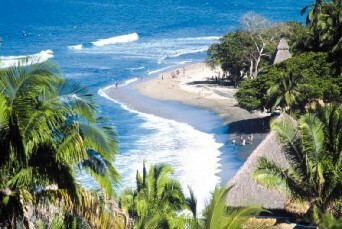 Just north of Puerto Vallarta, in the neighbor state of Jalisco, Mexico and spanning over 190 miles along the Pacific coast of Nayarit, Mexico’s Riviera Nayarit is not only a perfect holiday destination, but also the ideal place where many are establishing their temporary or permanent residence. Invited by the Four Seasons Punta Mita, I spend over a week exploring the destination and the many small villages and fishing towns that form this charming Riviera. There are nearly 200 miles of sandy beaches, resort hotels and attractions, siting at the foot of the Sierra Madre Mountain range. I visited some of the towns within the coastal line of the Riviera, like the famous Litibu Beach, the happening Bucerias, Cruz de Huanacaxtle, and the up and coming Nuevo Vallarta, but I fell in love with two of them in particular Sayulita and Punta de Mita, just minutes away from my hotel, where we came for a lovely outdoor dinner over Anclote Beach at Rosa Mexicano. Special thanks to Richard Zarkin from the Tourism Office of Riviera Nayarit, for taking a full day to introduce me to this region of unspoiled beauty. Unfortunately time was not on my side, and I missed visiting San Blas, from what I heard, the ultimate fishing village experience, a tropical Oasis, filled with tradition among estuaries, mangroves and hundreds of birds and spectacular marine life. FYI this is where you will get the fresh giant Blue Shrimps. Posted May 29th, 2013 & filed under Travel. Im mexican an I can tell you.. this IS NOT A GAY OR LESBIAN friendly resort, mostly visited for arrogant rich misogynous an homophobic people. DONT waste your money visiting this place go to San Miguel de Allende, Taxco, Xalapa or Veracruz this are gay friendly and civilized towns. Just to mention that the MAYOR of XALAPA ELizabeth Morales is the first leabian with this charge in the whole country.